The Acurus ACT-1 is a 1990's era surround processor. What's unusual about this processor is the discrete decoding circuit. As far as I'm aware, Acurus is the only manufacturer to ever use discrete audio circuits for video decoding. All other manufacturers past and present use integrated circuits. As for the sound, it's very good. 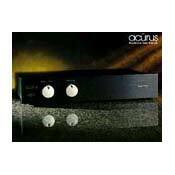 Compared even a high end receiver you will hear tighter bass, more natural midrange, and clearer treble. I really enjoy this unit. If there was a negative I would say the lack of a display. The remote and TV/display are needed to fine tune delay and other settings. The chassis has some sharp edges which will cut you. Not kid or pet friendly. There's a lot of hype around this deceptively obsolete home theater component but whatever. Living in Hawaii its hard to find good vintage audio equipment so when I saw the ACT-1 at an estate sale in LA I didn't hesitate. It had some history and belonged to a famous Hollywood insider who I never heard of which was a plus. If new receivers were good at decoding older movie scores I wouldn't have bought this. Great supplement to our home theater since we watch a lot of older movies. Expensive for a 20 year old processor. Hard to find in good condition especially if you live in Honolulu! This review is from the perspective as a Dolby Pro-Logic decoder. Bar none the best home theater decoder for HiFi VHS tapes. If you have a lot of VHS tapes you won't get a clearer or better soundstage than with the ACT-1. Oddly the more expensive ACT-3 is a weaker design and i'm not sure why considering it was a much more expensive decoder. On VHS HiFi audio this little guy even outperforms my friend's mega-buck ($6000) McIntosh MX122. Useless without the original remote. Only good for Dolby Pro-Logic. Vintage HT processor with discrete circuit. Super clean decoding. Small sturdy chassis. Excellent remote and instructions. Simplicity. Seems well built, but only time will tell. Paid $210 which seems expensive at first, but not really considering this is a near new audiophile hipster component for the VHS/DVD crowd. Age. Age. Age. Hoping it won't need service. Doesn't decode any audio or video format created after 1995. Paid $60 for the original remote because I'm stupid. Discrete decoding stage. Very clear and precise especially compared to my much more expensive Acurus ACT-3. Remote is incredibly functional and elegant compared to modern processor remotes. Simple. Slim chassis looks fantastic. Build quality like most Acurus equipment is mediocre. Doesn't play modern digital surround formats. Expensive, especially the remote which took me a year to find. A bit noisy, but not terrible like the ACT-3. One of the best values in Home Theater. These sold for around $800.00 street price when new. You can find them for under $300.00 on the used market. I have a McIntosh processor that costs around $4000.00 and this little ACT-1 will give you about 95% of the sound quality if you use it in a small to medium sized theater. I use it in conjunction with a 120" front projector and have watched about 50 movies in the last 4 months. It is a little hard to set up, but once you have it dialed in, the sound is breath taking and you can just leave it the way it is. I Bought this used on Canuck Audio Mart for $115 in ok condition. It exceeded my expectations. Just wish it had come with a remote. The lack of a display makes it hard to control, but once you have all the settings dialed in. NBD. Highly recommended if you're looking for first rate audiophile sound quality and don't mind the awkward interface. Oh yeah, it was engineered in the late 1990's so none of the new surround formats which don't really sound too good anyway. All I can say is WOW! I picked this up on eBay for $160. I was going to use this for the kids home theater but now it's in my main system. The sound quality is pretty extraordinary for the price. My Emotiva XSP-1 is more user friendly and versatile but at $1,000 that's to be expected. By comparison, the ACT 1 gives up nothing in sound quality. The clarity and build quality is in another class. Why don't they make stuff like this any more?? The only bad thing is that mine didn't come with a remote so I'm using the Redeye universal App on ios. It's a little clunky, but ok. My next purchase will be a matching ACT 1 remote if I can find one for cheap. I bought this processor for $100 used 6 years ago for a small bedroom home theater. It comes with a very simple but functional remote that's essential for operation. Best value purchase i've ever made. Sound quality is simply amazing. It easily competes with home theater receivers in the $2,000 range. I use an Anthem DV2 processor in my main home theater and while this processor is much more versatile, the ACT 1 has a much quieter background nearly the same sound quality. I liked the ACT-1 so much, I purchased a second Act-1 for my son last year when he went away for college. Unfortunately the price almost doubled and most units don't come with the original remote. Still, at $200 this is a real sleeper and giant killer in my opinion. The circuit is fully discrete, e.g., no integrated circuits, and can easily be repaired or modified which is an added bonus. Keep in mind this processor is about 20 years old and some used units may need servicing. Also, if you absolutely must have any of the digital decoding formats created in the last 20 years, the Act-1 will be a disappointment. But in my opinion, for a small room, the ACT-1's discrete Pro Logic discrete decoding is much better sounding than modern digital surround decoding formats.